The launch issue is totally gorgeous: 130 pages jam-packed with crafty projects for the festive season including wreaths, gift-wrapping ideas, ornaments, stockings, jewellery and cookies. I showed my Christmas-obsessed sister a copy and she ooohed over it for ages! For your chance to win a copy, just leave a comment on this blog post. I'm happy to ship internationally, so anyone can enter. Leave your comment before 10pm on Sunday 30th October (UK time) and I'll pick two winners at random on Monday 31st October. Ooh, Christmas is coming!! I am trying to be organized this year and plan my Christmas makes well in advance. I am determined to make an advent calendar in time this year (only 2 years later than I intended!!). This great giveaway may give me all the inspiration I need! Please count me in! At our house, Christmas is the reason we put up with he rest of the year! i absolutely adoreee christmas!! even though i live in the tropics and the weather is hot all year round! Dimitra Mavridou ......... It's what i need. Thank You very much. i would love it and a bit more cause i would never get it here in Germany!!!! Wonderful giveaway! Please count me in. Eu adoraria ganhar essa revista!! I was getting so tempted by Christmassy magazines in the supermarket this weekend. I have resisted so far, but I'm so excited about Christmas this year. Please count me in! That looks like a wonderful magazine! I would love to win. :) Thanks for the giveaway. Oooh looks great!! Especially all the buttons inside!!! The cover looks great so I bet the inside is just as wonderful! Count me in! Please random number generator, pick me!! That's amazing!! I'd love to have one..
looks like a fun mag to win! i would love to win this magazine. Just about to branch into sewing crafts with a sewing machine for my birthday in a few weeks. I'm always looking for new ideass to spark my creativity! A magazine, about crafts, for Christmas - what could be more perfect?! Please count me in a for a chance to win. This magazine looks wonderful. I'd love the chance to look through this one. Thanks for the chance. Ooh there would be no excuse for not having any inspiration with a copy of this magazine in my hands!! Christmas obsessed? Yup, sounds like me! I'd love the chance to win, thank you. Hello! My name is Esmeralda I'm from Spain. I like to participate in your drawing. OOOOhhh me me me pretty please :-) Am already getting my Christmas projects underway. yes would love to win a copy!! thanks for a chance!! I like this magazine .... I hope to be lucky! Thanks for the giveaway!! The magazine looks lovely! Count me in, please! Would love to check out a copy. Thanks for the opportunity! Wonderful! thanks for the giveaway. Oh wow! More ideas for Christmas- this should get my creative juices kick started. Please put my name in the giveaway and I'll keep my fingers crossed. Only 62 days and this is the type of gift that is right up my alley! I would so love to win a copy of that magazine. Looks like an awesome new magazine! such cute ideas in every issue! Looks like another great magazine. I would so love to win this so please pick me! thanks for the opportunity. I'd LOVE, LOVE, LOVE a copy! I can't find that magazine anywhere around here and if I order it online it will take 6-8 weeks for delivery. I've never looked through a Stitch Craft Create magazine before and would like to see it contents before subscribing! So if you please, you would be doing me a GREAT favor by choosing me!!! Oooooh. I'd love to win this! I have an amazing flavor to this magazine. I live in a small town and there is not such a miracle to win, sometimes I go to Krakow, to the bookstore, but I have never met to buy. Perhaps fortunately for me, Hello! Christmas 'make and do day' is coming up - when my friends and I get together to do Christmassy crafting - this magazine would be perfect for inspiration! Have put it in my cart several times to buy but don't really have the money. I would LOVE a copy!!! Ooo count me in please! Looks fantastic! Looks fab! Could do with some inspiration to kickstart my mojo! Would loooove to have one! Thank you for the opportunity! I've already seen it around blogs, it looks like a great magazine. That’s a new one on me, but if you can tell a magazine by its cover, it’ll be agood one. This looks like an awesome magazine! It looks a lovely magazine, I'd love a chance to win a copy, especially as it's only available in the US? Just found your blog via an owl template image google search and am enjoying it very much, have added it to my faves. ΜΑΚΑΡΙ ΝΑ ΚΕΡΔΙΣΩ ΠΟΛΥ ΘΑ ΤΟ ΗΘΕΛΑ!!!ΕΥΧΑΡΙΣΤΟΥΜΕ. I just last week tried to buy a copy....went to 3 different fabric stores and none of them carried the magazine!! I would love to win this magazine. ooh please pop me in your giveaway Laura, need a little inspiration at the moment and that mag looks fab! The magagine looks awsome plus its packed with christmas themed crafts! so count me in! Is it possible to say I'm obsessed with these kinds of mags? Ohhhhhhhhhh, that will be great to win one of them. Pleaseeeee. what a cute cover! thanks for sharing the goodies! I don't know that magazine but it looks intriguing ! So i'm in !!! I have seen this advertised and want a copy really bad!! Would love to win one of yours....thanks for sharing. Looks like a neat magazine! I am always looking for new ideas for crafts to sell at our church bazaar. Pick me, please! Lovely!! Pick me, pick me!! Wow - would love the chance to win :-) It looks great and it could be 2012 before it gets to New Zealand in the shops! Ohhh what a cute magzine! I love Xmas! Just in time for Christmas projects. Pick me! Thank you very much for this opportunity ;-) I would very much like to win a copy of this wonderful magazine. I'd love to win one of those magazines, I need new ideas for Christmas. Count me in! It looks like an inspiring read. I'm BooTeeq on twitter. Oh!!! This is a great book!! Perfectly lovely, I'd love a chance to win. All that christmassy goodness looks great! ohhhh lovely buttons! Thanks for the chance to win! Been crafting more lately trying to prepare for holidays. Also just got back into quilting, remembered how satisfying it really is. 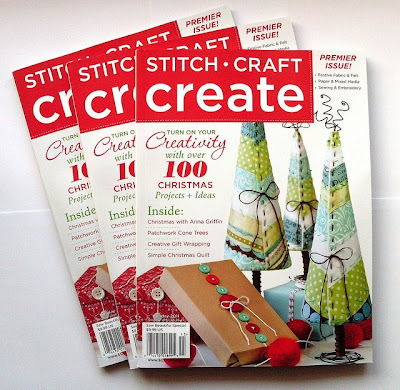 Stitch Craft Create Magazine looks to have some really great ideas and articles. Looking for ideas on finishing fleece projects (jackets). Should I just hem? Oh how I love magazines, I get many ideas and lots of inspiration. Thanks for the chance! I want to enter, too. Thank you. Oh please!! It looks fantastic! How much fun this would be to get my children all together and make an entire day or two out of fellowship and creativity, something we have not done since they were all little. Would love a copy!! Looks great! wow! Looks like a great magazine!!! I would love to win your magazine. Just in time for some Christmas crafting. Smells like Christmas! Thanks for the chance to get some extra inspiration in this time of year! How Fun! I would love to win a copy of the magazine! oh yes please, looks like a really great mag. Christmas + Crafty = sure fire winner to me. That magazine would make my day! Oh, this looks like a fun magazine!! I am really looking forward to getting into Christmas crafts - this magazine looks wonderful! Would love to check out this magazine...is it a UK publication? Oh I would love to win this magazine. Please pick me. Great mag, count me in, I need some inspiration! Wonderful giveaway! :) Please add me for the draw. Thank you! Oh wow, I'd love to win! In the very unlikely event that I don't, do you know where I can buy it from as a Google search hasn't brought anything up. This magazine will be great to leaf through during the dark days of winter that are already on the way up north where I live - thanks for the giveaway! Looks like a great magazine! I'm new to felt creations and am sure they are full of inspiration. Thanks for the give-a-way! Ooh, I do love new mags :) Would love to be put in the hat for this one! I would love some crafting inspiration. Count me in. This magazine looks great - count me in! Wheee... I'd love to win this magazine - it looks very inviting. Count me in! There's nothing I love more about Christmas than decorating, especially with homemade decorations! This mag looks *gorgeous*. Would love to look thru this new mag. Thanks for the chance to win! I would love to be able to win this magazine! Thanks for the chance! Hi Laura, I'm like your sister,a Christmas obsessed person. Count me in pleaseeeeeee. oooh! I would love to win a copy of Stitch Craft Create! Looks like it's chock full of great stuff! (As is your new book, which I LOVE!) I hope I win! Thanks for the opportunity! So cool! Hope I get it! I want to participate and win...I love your blog! Looks like a fun mag!! I would love to win a copy..new magazines don't often make their way over here to NZ. I lov christmas and this magazine is wonderful!